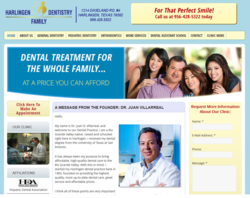 The new Harlingen Family Dentistry website can be viewed on any computer or mobile device! In three years, it is expected that more people will be accessing the Internet from mobile phones than from computers. The Harlingen Family Dentistry has brought on-line a new, more accessible website design to help Rio Grande Valley residents in need of immediate dental care seeking a dental office. The design change incorporates the latest technology that gives the website the ability to be “responsive” so it will adjust its size to fit a mobile phone screen as easily as it does a laptop or a large computer monitor. It will allow those on their iPhone or Android smart phones web access to the dental and contact information for HFD anywhere they are or anytime they want. The Harlingen Family Dentistry website has an on-line appointment form as well as information on the wide variety of dental services that all the staff at HFD provide. From pediatric dentistry to orthodontics to oral surgery to cosmetic dentistry, HFD serves adults, teens and children. Centrally located in Harlingen, the clinic provides dental office services across the Rio Grande Valley from Brownsville to McAllen. “Since 1983, we have continued to expand and this new service is just one aspect of our continuous dedication to servicing our clients and the people of the Rio Grande Valley. We are even more dedicated and proud of our advances in our facilities and the dental technology we provide. We will be making a major announcement about this shortly,” concluded Dr. Villarreal.